Yeah, I used to sing this song to my baby in 1976. No sweet lullabies from me, nosiree, which could explain a whole lot come to think of it. Deluge – this could be it. In real time, we have unrelenting, pounding rain that is filling our streets, our shoes, our storm drains and, most of all, making my hair curl in the most uncontrollable, hysterical way. Since there is no real end in sight for a few days, I thought I’d post a photo of the fruits of last weekend’s labor with the indigo pot. When summer skies look like that again, I’ll drag out the accordion. 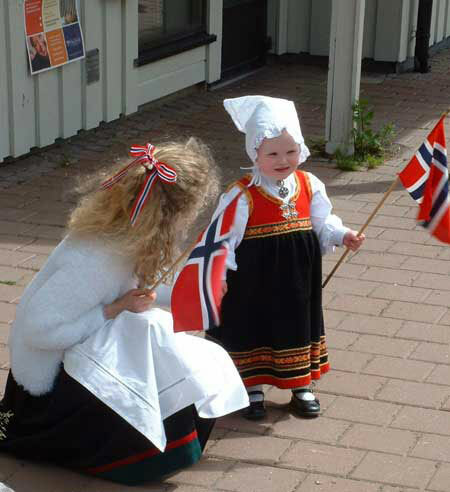 17.mai is Constitution Day in Norway, marking the country’s independence from Sweden. Celebrations begin at sunrise in every town, village and city throughout the country with parades, speeches, picnics and music, often lasting late into the night. Women, men and children dress in their traditional costumes, or bunad, the design of which is based upon one’s region of birth. 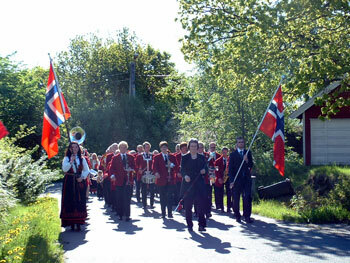 The tradition of the bunad arose around the same time as Norway’s independence and emergence as a country in the early 1800’s. Each region of the country was encouraged to incorporate their local needle arts and metalworking traditions into the design of a unique dress costume as a method of fostering a national culture and identification after the country’s long period of occupation by various countries and invaders. 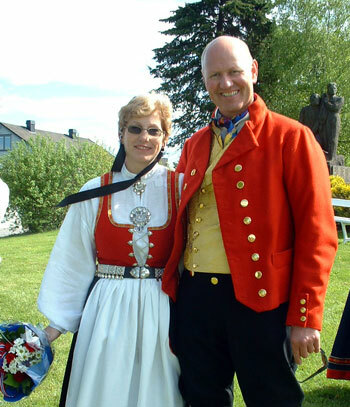 The bunad today is unchanged from its original, officially adopted design, thanks in large part to what many Norwegians refer to as “the bunad police,” a group of officials in each region of the country who certify the authenticity of every bunad made. And, not only does one have to have their costume “certified” but the individual themselves must prove that they are entitled to wear a particular region’s bunad which is based on maternal lineage and one’s own place of birth. The making of one’s bunad is traditionally done entirely by hand, and supervised by the “bunad police” every step of the way. It may take years for a young woman or (increasingly) man to complete their costume. 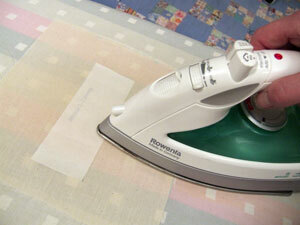 It’s expensive, time consuming and requires considerable skill with a needle and thread. Once complete, the bunad is worn on 17.mai (of course) and also for other special days and ceremonial events such as weddings. Gratulerer med dagen! til alle Norge. Take a mini-tour of my workspace and meet the human behind ThreadingWater. Since I’m working on deadline today, struggling with the demons of graphic design, my brain is (temporarily) out of commission. 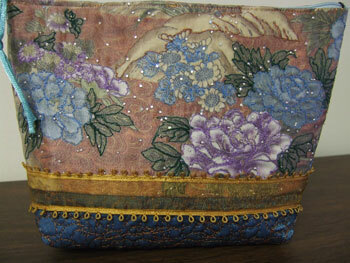 That means you get threadwork pictures instead of political content.This is a small makeup or whatever bag that I put together for my friend, Sarah. 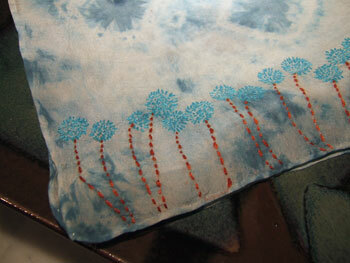 I’m honing my skills at free-form sewing while I await the return of names for The Mother’s Day Project. btw: If you’re still in possession of a “name,” now’s the time to send it on home to me. Thanks. 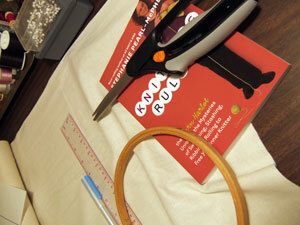 “Knitting Rules” just happens to be exactly the right size to use as a template for the muslin squares! This is going to work. I have a spreadsheet, a bolt of unbleached muslin, and I practiced some stitching techniques last night in order to make some recommendations on technique. I experimented with embroidery floss and thread. There are already about thirty participants which means we could use more willing hands. Please continue getting the word out and keep checking back for updates on the project. I’m planning to add a separate page for Project information and hope to have a graphic button that bloggers can add to their websites. 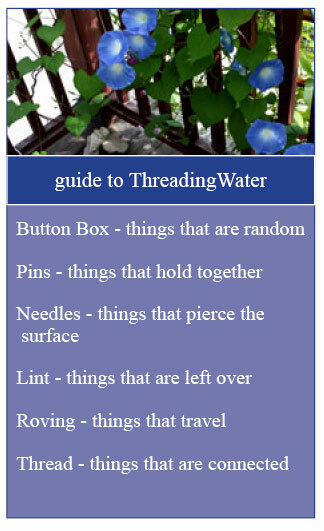 To join the Project, send an email to threadingwater (at) sbcglobal (dot) net. Include your mailing address and, if you don’t receive a confirmation from me within 48 hours, let me know. Thank you, everyone, for the enthusiastic response and for your kind and generous comments. There was one camp, though, that haunts me still and at regular intervals. Ravensbruck. It was a camp for women and children, like women and children don’t already suffer enough during times of war. Hell, even in times of peace. 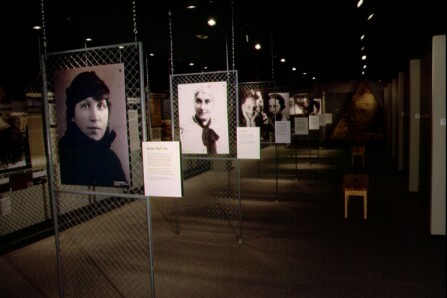 And, here’s what moved me the most – a simple display of the camp’s survivors who, in their ordinariness, revealed more devastatingly than any tribute or memorial could about the extent of what was lost to so many others. Women as mothers, wives, friends, grandmothers. Women in their gardens. Women smiling at the camera, waving on a summer day. Extraordinary women doing ordinary things, in ordinary ways, remarkable because they – unlike so many others – walked out of Ravensbruck alive. As another Mother’s Day nears, I started wondering how many women soldiers have lost their lives in Iraq? How many mothers, wives, lovers? How many women who would have been mothers, wives, lovers, friends? As of today, the answer to how many female soldiers have died in Iraq since the beginning of the war is 79. I know their names. Here is my idea for The Mother’s Day Project. 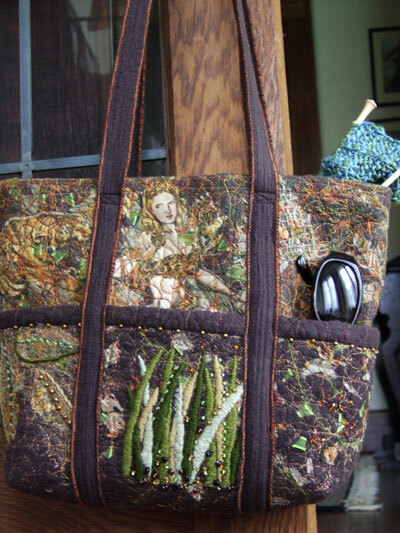 You know the sort of fiber-arts work I’ve been doing lately. I would like to make a tote bag and incorporate the names of these soldiers. I want to hand-stitch the names on muslin fabric, but I’d like to have many different hands contributing to the stitching. I need volunteers. I don’t care one whit how accomplished you are with a needle. Anything goes as long as the name is readable. I will provide the names (pre-stamped so you simply outline the letters with stitching) and the fabric and, if you need help with the return postage, I’ll even take care of that detail. Once I have all the stitched names, I’ll assemble the tote. 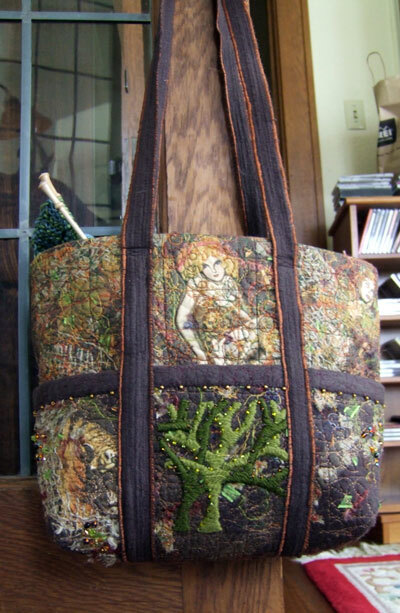 Why a tote? Because I want something utilitarian. Something that will go out into the world every day as a reminder of this horrible loss, made more horrible as people recognize that these names represent only a very small portion of the human toll this war has taken. 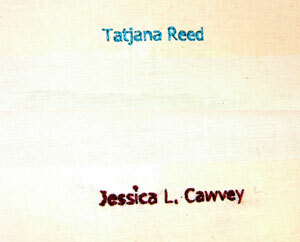 And, for every volunteer who contributes a stitched name, I will send the tote to you. Put it to use. Take it to the market, keep it in your mini-van as you drive your kids to school. Stuff it with your knitting. A week. Two. Whatever seems right to you. All I ask in return is that you keep sending the tote on, and that you record your feelings and experiences with the project on your blog (if you have one) or in a letter. 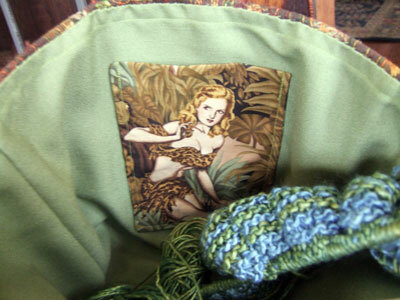 Obviously, this project will not be completed by Mother’s Day, 2007. That’s OK. If you would like to participate, send your contact information to mothersdayproject (at) sbcglobal (dot) net. 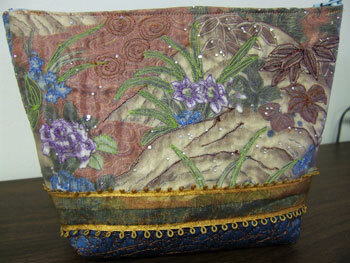 In a rush today, but wanted to show you the finished tote bag. I’m not thrilled with the straps (too long and they have a tendency to go twisty), but I have some ideas for improving that small annoyance.